Charles Delort was born in Nimes, France, on February 4, 1841 and spent the early part of his life in the area around Bordeaux. At the age of 12 he entered the naval Academy, but the strict training was not to his liking and he soon left. He met M. Duhousset, the Professor of Design at the college of Lorient, in Brittany and studied with him for a short time. It soon became clear to Charles that Duhousset’s mission was to prepare and persuade him to enter military school (l’Ecole de etat-major). He left his studies in Brittany and headed for Paris. 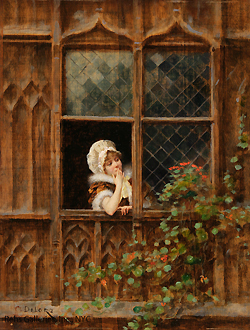 Delort arrived in Paris in 1859 and thanks to the recommendation of Gérôme (a family friend), he entered the studio of Gleyre where he made rapid progress. It was during his training with Gleyre that George Pradel noted in Les Aquarellists, Paris 1883, where Delort acquired … those warm, refined, yet vigorous octaves of color which we are to find at a later period in all his work. In 1862 Gérôme sailed for Egypt and Delort, seeing the opportunity for a close relationship with the master, accompanied him. 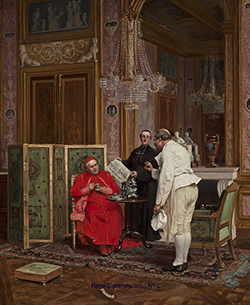 With Gérôme as his mentor and guide, Delort was able to complete an important series of studies during the journey and upon returning to Paris, he entered the competition for the Prix de Rome. Delort spent the next few years in his retreat at Marlotte, where he studied and worked on his technique. In 1866 he was ready to exhibit and made his debut at the Paris Salon with his work – Daphnis and Chloe. The work was a great success and as he continued to exhibit his popularity rose … collectors and dealers soon learned the way to his studio in Marlotte. In 1875 he exhibited his most celebrated work – The Embarcation of Manon Lescaut for Louisiana – which won him a medal. It was from this point that he seems to have devoted his career to scenes of the 18th century.